CETA also seeks to create new markets by opening up public services and government procurement contracts to competition from transnational corporations, threatening to introduce a further wave of privatisations in key sectors, such as health and education. Only the rights of corporations are clarified; those of workers are ignored or couched in vague provisions. Not only does CETA not contain a clause saying that respect for human rights is an essential element of the deal, it does not include binding and enforceable measures to ensure ILO core labour standards are respected in its sustainable development chapter. Furthermore, the public procurement provisions do not include explicit obligations to respect labour and environmental standards nor promote the use of social and environmental criteria in public tenders. CETA will be provisionally applied by the Irish government on September 21st 2017. This means that all its provisions, except the investor –state dispute mechanism will become effective in Ireland from today. Below are outlined some of the reasons why all trade unionists should actively oppose this deal. For the first time the EU has negotiated on our behalf, a trade deal with a “negative list” for services. This means that unless EU governments have explicitly excluded specific services, – and ours excluded only a few – all services, including new public services, will be automatically open to competition from foreign- service providers. Jargon-filled mechanisms like “standstill” and “ratchet” clauses lock-in current and further liberalisation, making it very difficult and costly for countries to bring services back into public ownership. Local and national governments use public tenders to fulfil public policy choices. That means companies bidding for public contracts must abide by agreed criteria that may include social, labour or environmental sustainability clauses. CETA’s Procurement Chapter fails to include any watertight clauses that uphold social criteria. Instead contracts can be awarded to the “most beneficial” or “the cheapest offer”. CETA, along with other deals limits our ability to redefine and enhance the tools we use to achieve important public policy goals. Public services are exempted from market access, national treatment and performance requirements and the most-favoured-nation provisions of the investment chapter only to the extent that they are ‘carried out neither on a commercial basis nor in competition with one or more economic operators’. This is the phantom public sector carve-out established in the World Trade Organisation’s (WTO) General Agreement on Trade in Services (GATS) agreement. As there are pockets of private business in most public services, few meet these criteria. Standstill and ratchet clauses freeze current levels of privatisation, making it difficult, and costly, for governments to take privatised services back into public hands. Crucially, in its sustainable development chapter, CETA does not contain binding and enforceable measures to ensure ILO core labour standards are respected, while the public procurement provisions do not include explicit obligations to respect labour and environmental standards nor promote the use of social and environmental criteria in public tenders. It promotes workers’ access to labour ‘tribunals’ rather than recognising and explicitly accepting EU member states’ workers’ rights. Unlike the enforceable exclusive rights for investors, CETA includes no binding rules to protect and improve worker’s rights and environmental protection. The Confederation of German Trade Unions (DGB) criticised this, calling for “the chapters on workers’ rights, environmental protection and sustainable development to be as enforceable as the rest of the agreement” but the final text doesn’t meet these demands. Instead it says: ‘Nothing in the Agreement should prevent the Parties from applying their national laws provided that, in doing so, they do not nullify or impair the benefits accruing from the Agreement.’ So, where does this leave SEOs or collective agreements for example? But perhaps the most important reason we should be very concerned about CETA is that it is a back door for American corporations to challenge standards and regulations in the EU through their subsidiaries in Canada. All an American agriculture, energy or drug giant would have to do is to challenge EU standards through ISDS using their existing subsidiaries in Canada or set one up in order to do so. Of the ILO’s 189 Conventions, Canada has only ratified 34. Canada has only ratified eight of the 31 ILO Conventions developed since 1982. Canada has only now ratified all eight ILO fundamental Conventions. It had been one of only 24 countries in the world that had not ratified Convention No. 98 – Right to Organize and Collective Bargaining (1949), but it did in early July of this year just prior to CETA debates in some EU national parliaments. However, a country may secede from ILO conventions by giving one years’ notice. Since 1982, unions in Canada have filed more complaints to the ILO’s Freedom of Association Committee than the national labour movements of any other country and there have been 86 ILO complaints filed against Canada, the ILO has ruled on 85 of these cases and found that freedom of association principles had been violated in 78 instances. Because worker’s rights will be compromised by Regulatory Cooperation in CETA. There will be continual pressure on regulations and standards, as CETA is also a back door for American corporations – who control around 55% of the Canadian economy – to challenge standards and regulations in the EU through their subsidiaries in Canada. All an American agriculture, energy or drug giant would have to do is to challenge European standards through ICS using their subsidiaries in Canada. Meanwhile, socially desirable or progressive labour legislation which might affect corporative profits would have to be notified to the governing Regulatory Cooperation Council one year in advance and would likely be identified as a ‘barrier to trade’ by the stakeholders – corporations and EU Commission and we would never hear about it. As regulations covering everything not listed as exempt, from chemicals through to education and public procurement converge, the only remaining means for increasing competitiveness is through reductions in workers terms and conditions. This is likely to involve union de-recognition, a reduction in voluntarism, attacks on collective agreements and a retreat from our accepted right to organise. Furthermore, a country may secede from ILO conventions by giving one years’ notice. But irrespective of the ILO perspective, there still remains the overriding concern surrounding ISDS – renamed ICS but like Windscale, which was renamed Sellafield, it remains just as toxic! Not only does this dispute settlement system accord transnational companies the right to sue sovereign states before arbitrary tribunals, if their ‘reasonable expectations’ of profits might be jeopardised by some legislative measure, but it directly threatens workers terms and conditions. This was illustrated forcibly last year when Egypt was sued under a similar deal for attempting to raise the minimum wage. One can only imagine the list of possible measures; maternity leave, minimum annual holidays, extended unfair dismissals legislation, pension legislation- the list goes on. Because the ICTU has adopted a progressive position on CETA. 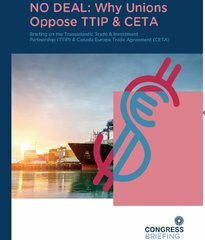 The ICTU has adopted a position of ‘outright opposition’ to this deal and calls for a progressive trade agenda, which means not only the inclusion of a social dimension in all trade agreements but also the full preservation and improvement of the right of governments and authorities to regulate the economy in the public interest as they see fit. CETA is a trade deal for corporate interests and the ICTU reiterates that workers will never accept any trade agreement that doesn’t promote decent jobs and growth while safeguarding labour, consumer, environmental and health and safety standards. 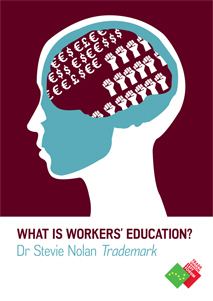 Irrespective of your view of the ICTU, this position should be uncritically supported and promulgated by all trade unionists. The struggle against CETA and other such trade deals such as TTIP and TISA, being negotiated ‘on our behalf’ by the EU is only beginning.